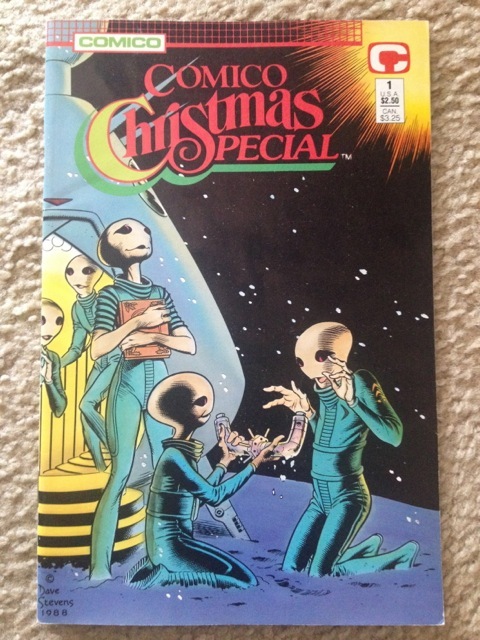 On this Christmas Eve, let’s look at Comico Christmas Special, a one shot published in 1988. Comico was a independent publisher in the 1980’s perhaps best known for being the home of Matt Wagner’s Grendel, although the company published a wide variety of titles during their fifteen year history including The Rocketeer and several licensed properties. Indeed, Rocketeer creators Dave Stevens provided the atmospheric cover. All the stories in this collection are written by Doug Wheeler, a comic artist and writer who is best known for his tenure on DC Comics’ Swamp Thing after Rich Veitch left the book due to creative conflicts with editors. 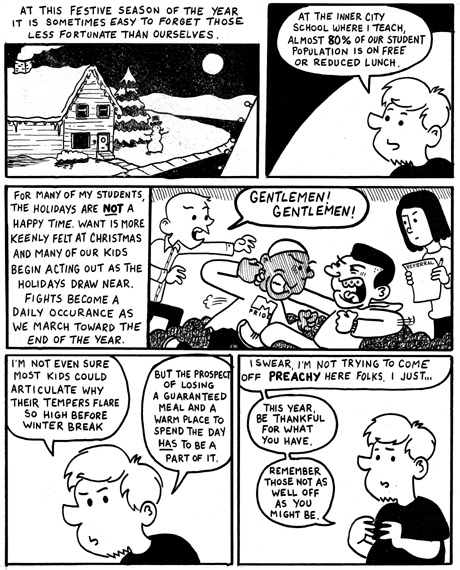 Besides this comic’s yuletide connotations, I wanted to take a look at this book because it’s a pretty broad, sweeping look at the holidays from one specific point of view. Whatever there is to be said about the artists in this book, it’s clear that this is entirely a Doug Wheeler joint. So what did he have to say about Christmas? Well… quite a lot, actually! This week we’ll be looking at Superman #165, published in December of 2001 by DC Comics. The book was written by Jeph Loeb and was something of an all-star “jam” issue featuring a who’s who of popular superhero comic artists. Cover prices was $2.25. 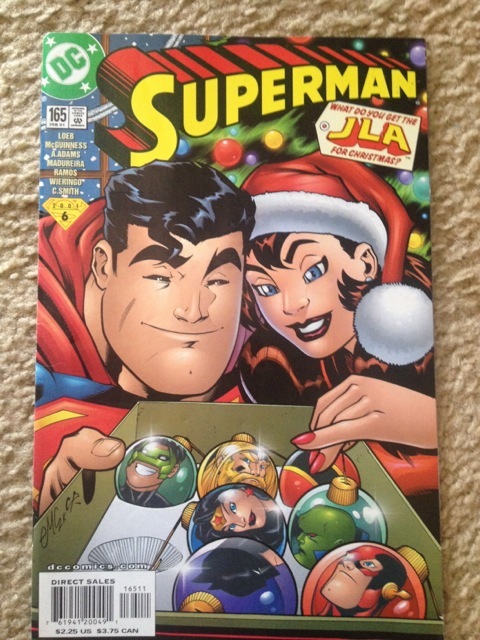 Superman’s been involved with some great Christmas stories in his 75 year history, but this one is different in that it’s highly connected with several ongoing stories within the Superman family of titles. In brief: Lex Luthor has just been elected President of the United States of America. Superman is obviously quite conflicted about this development and spends this issue visiting with the various members of the Justice League to get their take on the recent election results. Coming off of yesterday’s comic, I thought I’d post this blast from the past. It’s a page from a never-completed project I was working on during my senior year of college. Titled “The Agony of Da-Feet,” it was about my coming to terms with something my then-girlfriend said when she dumped me… namely, that she had fallen out of love with me during an ill-advised spring break trip to Toronto, during which I was in something of a foul mood. Some cats play the blues, I drew this comic. I was trying to justify my attitude by pointing out how I spent much of the trip in absolute agony thanks to a problem I was having with my feet, among other annoyances like the Canadian government’s newly strict border policy due to 9/11. These things had little or nothing to do with Shannon or our relationship… but the idea they could snowball into something that would make a person fall out of love with me seemed like a good idea for a book. I got about seven pages in and… I’m not sure what happened. I was still pining for Shan, but everything seemed a little less important to me. 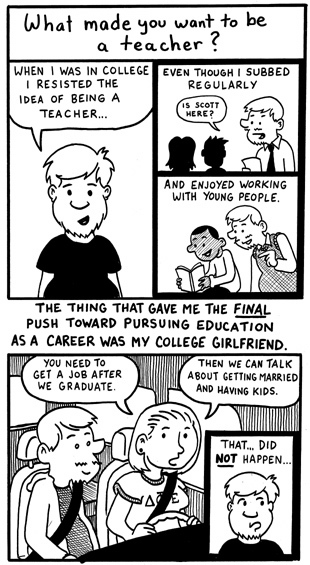 After being in a committed relationship through most of college, I found I had adequately proven my mettle to most of the female population of my college and was, I daresay, something of a serial dater during much of the last semester and a half of my undergrad years. I still hurt… but not bad enough that I needed to get it on the page. I keep a lot of my old comics and artwork. Generally, they make me cringe when I look at them. This comic does not. Sometimes I even think about going back and finishing the thing, but there’s been too much water under the bridge. Still: Thought it was interesting, decided to post it. Over the summer, I made an offer on Tumblr: Ask me any question you like and I will answer it in comic form. For the upcoming winter break, I’m making that same offer. 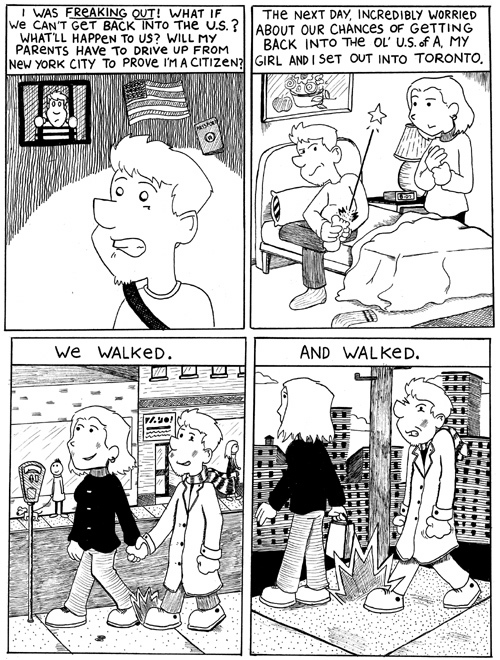 Leave a question in the comics and if it strikes my fancy, I will give it the comic strip treatment. 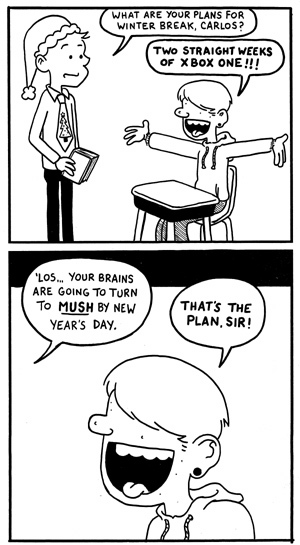 If I don’t get any questions I’m taking the rest of 2013 off from comic making… so get to it! 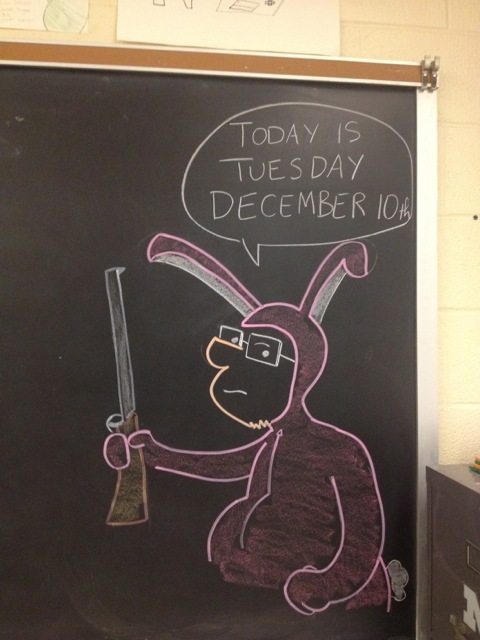 I draw a picture of myself on my classroom’s chalkboard everyday. I collect those pictures as camera phone photos and post them on Sundays. See the rest here. 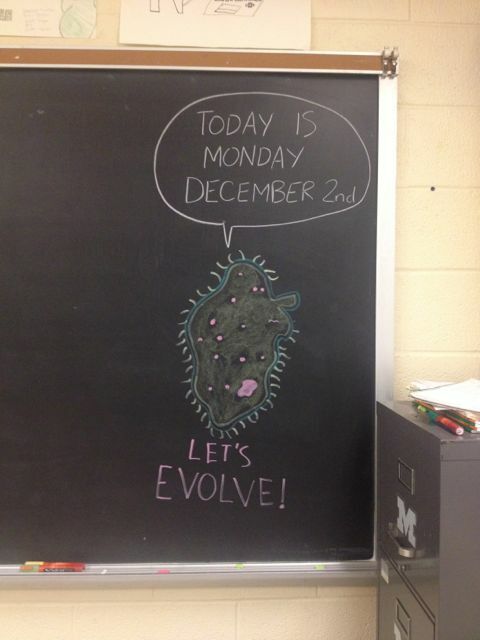 Thankfully, my laptop decided to comply, so I can present to you all a holiday themed week on my chalkboard. My choices were slightly upset by an unplanned snowday midweek, but you won’t hear me complaining. You are currently browsing the Teachable Moments blog archives for December, 2013.